There's definitely a reason for that warning about working with children and animals, haha! Olive green has become one of my favourite colour and it's so on trend this season. Love both of your looks, the scarves are beautiful details. I love both of these outfits! They're so perfect for spring! Oh no! And sorry to hear your son wasn't feeling well. That's never fun. But I had to giggle at your story trying to photograph the chicken! Those photos can be so tough sometimes! But it looks like you managed a good one! haha yes I'm glad I managed to get a pick with him in the end! Wow, dear Mica, you are a really good purchaser! 11 pieces for the boys for 5 $! So sorry the first day ended that unpleasent. I'm relieved to read your boy felt well again after 24 hours. But I understand you loved the first look and I can imagine you wished to have worn other shoes on the humid other day! Thanks for the reminder to wear my olive jeans again. :) And oh my! What a day you had in that outfit!! So sorry your son was sick (all over you...the WORST!) but glad to hear he's doing better now! Hope this coming weekend is a little more even-keeled! Such cute outfits! Love the scarves! You are such a cutie! Love the scarf, hun! I like the touch of the scarf, babe! 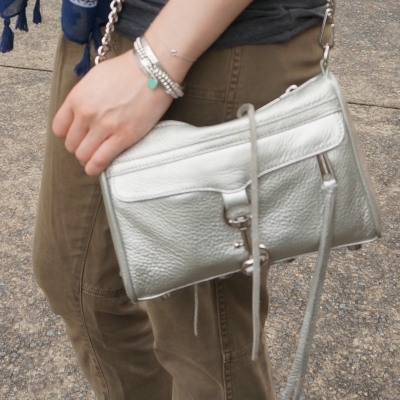 NEW POST: ZARA $200 GIVEAWAY!! I really love the olive shade for trousers; it's something I've been meaning to add to my wardrobe and yet still haven't got around to. Great styling babe!! And that is why basic tees are right for you! Getting thrown up on - zoiks! I cannot even imagine. Chasing chickens does sound hilarious, though. Glad your little one is okay. Have an awesome weekend, Mica! haha yes, it's an interesting experience having kids! Basics are a must! I giggled a bit trying to imagine your husband trying to take photographs of you with some birds and two toddlers trying to catch the above mentioned birds. 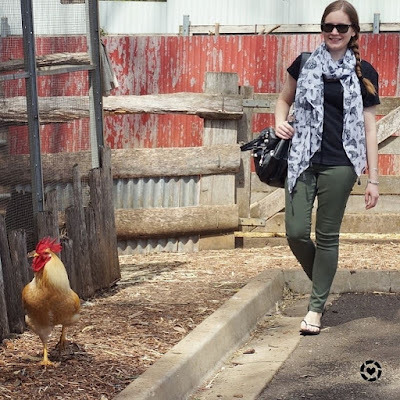 :) It was a fun idea to wear a bird printed scarf to the petting zoo, even if the chicken kept running away from the shot. :) Both of these outfits are lovely. Jeans and a dark top is a nice formula. Sorry to hear about your son's stomach bug but glad that it wasn't long lasting. Yesterday a lot of kids in my school complained about tummy pains, I think there is a stomach bug going around...these things are always unpleasant, the best we can do is hope they don't last long. Oh dear I hope the stomach bug passes quickly, they spread so quickly between kids! That is so cute you wanted to coordinate your scarf with the rooster! And sorry your son got sick all over your outfit. Why do kids always get stomach sick? Black and olive are such a classic color combination that always works. Sorry to hear your son got sick. It must have been a relief that it was only a 24 hour bug. Yes I'm glad he recovered so quickly! Casual and cute! A nice tee and jeans are always such a great choice for everyday. Add the perfect set of accessories and you're ready to go. What a great scarf to wear to the petting zoo! Hahaha. I had a good chuckle over that. I however felt sorry for you little one. I am glad it was short lived and he was back to himself in no time. Well, that eventful day won't be soon forgotten. And heck, if you couldn't get the photo with the birds, at least you had them on your scarf!! I am so thankful that my daughter is very aware of when she feels sick and gives us a good warning! I'm glad your son is feeling better now! 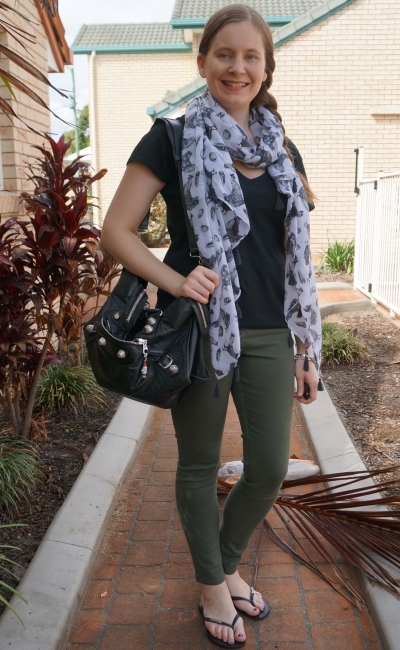 Your printed scarves are so fun in both outfits! The petting zoo sounds like a lot of fun. Sorry to hear you son got sick at the end of the day. Also 11 piece of kids clothes for 5 dollars is a huge score. Have a great weekend. I think we are going to have another lazy weekend over here. I'm glad your son is feeling better and sorry about the unfortunate ending to your day. I love both of the casual looks. A pants, tee and printed scarf combination is a great classic look that always works. Olive looks good with every color doesn't t it? It s a fabulous color! Enjoy your weekend! You look super cute! I love that scarf! 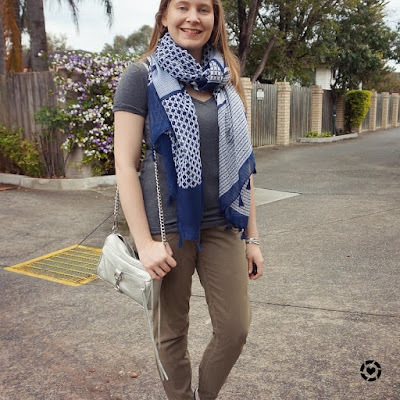 very nice outfit for spring, love the scarf too. i'm so sorry to hear about your son, good to know he's better now. How fab that you are a rep for Fashion Scarf Girl! And I love that you matched your scarf to your day out at the petting zoo - so cute! Sorry to hear your son wasn't feeling so good and glad it turned out to be nothing too serious! Such cute looks! You are always so great styling scarves! I really like those olive pants! I don't think I have any cargo pants, but I love yours on you! You have a great selection of scarves I notice and really wear them a lot with your outfits. I need to be better about getting mine out! They are a fun way to add some colour to an outfit :) You'll be wearing yours for warmth soon! Haha! I love how your husband tried to take picture while holding two kiddos! LOL! I adore your first outfit, very chic mama! He was very patient, haha! 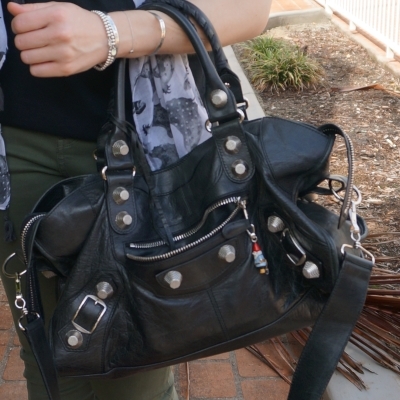 Love your outfits and video...unfortunately I can't afford either right now:( :( :( Hopefully soon though! Definitely my kind of casual laid-back outfit Mica. You have the best scarves I must say. YAY the chicken pictures!!! My fave haha. I'm sorry that day ended so poorly though, yikes! It was definitely a very eventful day with the chicken pics, haha! Cute cozy look dear. Love the simplicity and practicality of the outfit. You pull off olive and cargo pants so easily Mica. I am getting some inspo to get some! I LOVE your scarves! You do a great job with pairing your outfits. I love your bag. Looks super spacious! It is so funny that the chicken kept on trying to run away. Glad your son's stomach felt better within 24H. You always find the best deals! Yes I'm so glad he helped, there was no way I could have managed with the tripod and remote like I do the rest of the time, haha! I love olive/khaki pants! They're a great alternative to blue jeans. The day at the zoo was certainly one you wouldn't forget in a hurry. Poor little guy! Those bugs really hit the kiddies hard, glad it was only a 24 hour one. Yes it was a real roller coaster of a day! I was glad when he was feeling better! Oh no! It sounds like the first part of that day was fun, and I love how your scarf matched the setting :) I'm sorry your little guy was sick though, that is never fun. I just got a new pair of olive jeans, so thanks for the styling inspiration!